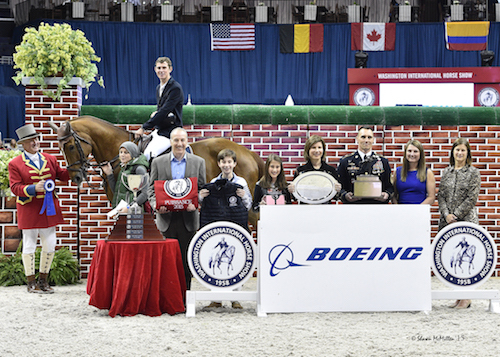 WASHINGTON, October 23, 2015 – The 2015 Washington International Horse Show (WIHS) featured a variety of fantastic competition on Friday, concluding in the evening with its annual $25,000 The Boeing Company International Jumper Puissance at Verizon Center in Washington, D.C. 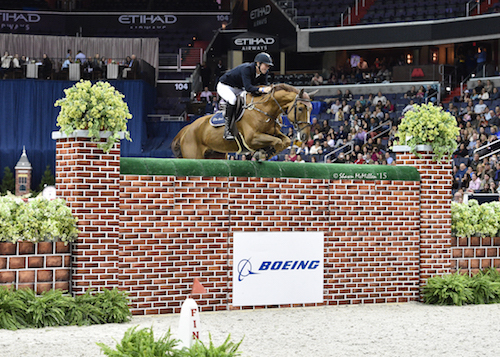 In his first trip to WIHS and competing in his first Puissance ever, Belgium’s Jos Verlooy cleared the wall up to 2.13m (6’11”) to earn the winning prize with his top mount, Sunshine. In other jumper competition, Belgium’s Nicola Philippaerts and H&M Harley van de Bisschop topped the $50,000 International Jumper Speed Final, sponsored by Rushy Marsh Farm and AAA Equestrian. Caelinn Leahy and Esquilino Bay and Lacey Gilbertson aboard Easy Money triumphed in the Junior/Amateur-Owner Jumpers. 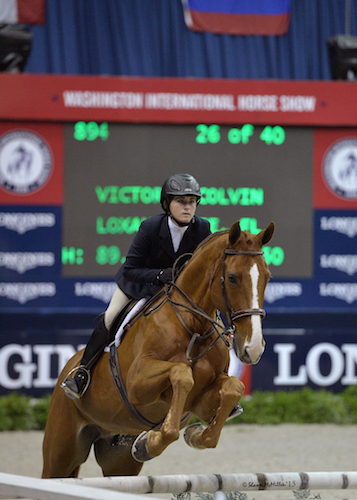 Victoria Colvin dominated the hunter and equitation competition. The young rider guided Small Affair to the Grand Junior Hunter Championship and was named Best Child Rider on a Horse in her last year as a junior competitor. 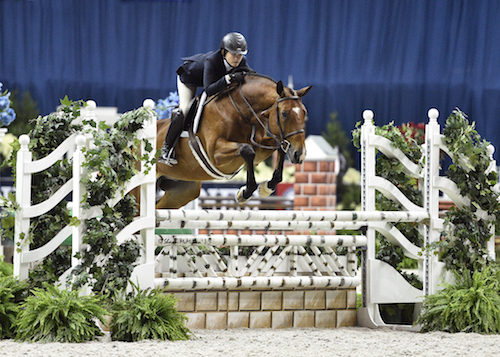 She also led the way in the hunter phase of the WIHS Equitation Finals, presented by SAP. Belgium's Jos Verlooy and Sunshine clear the Puissance wall at 2.13 meters (6'11"). © Shawn McMillen Photography. Jos Verlooy and Sunshine in their winning presentation. © Shawn McMillen Photography. 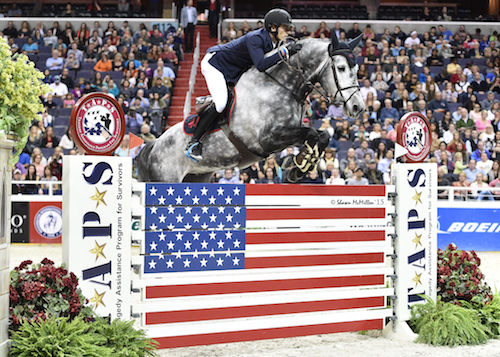 In his first trip to WIHS, Verlooy enjoyed the Friday night crowd and great atmosphere at one of the top show jumping competitions on the calendar in North America. Nicola Philippaerts and H&M Harley vd Bisschop. © Shawn McMillen Photography. Nicola Philippaerts and H&M Harley vd Bisschop in their winning presentation. © Shawn McMillen Photography. WIHS has been a great show for the Philippaerts family in recent years and Nicola enjoys the great competition and atmosphere each year. 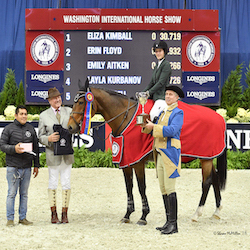 The Junior Hunter divisions concluded their second day of competition at WIHS on Friday morning with the presentation of their championship awards. 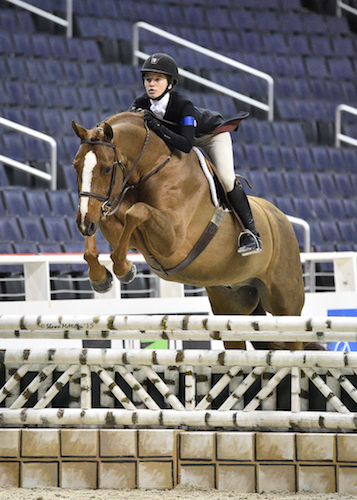 The Grand Junior Hunter Championship was awarded to Small Affair, ridden by Victoria Colvin of Loxahatchee, FL. They were presented with the Ides of March Perpetual Trophy, donated by Linda Lee and Lee Reynolds. 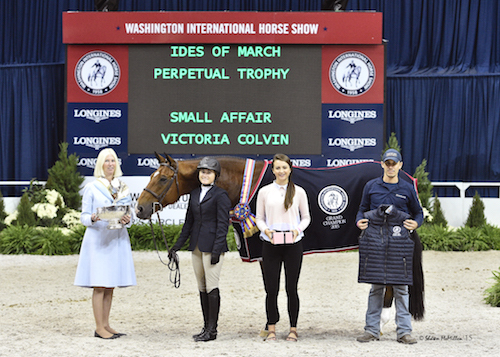 Colvin then earned the award for Best Child Rider on a Horse and earned the special DiVecchia Perpetual Trophy. That award was sponsored by Gotham North; the trophy donated by Mr. and Mrs. Frederick DiVecchia. Small Affair and Victoria Colvin in their Grand Champion Junior Hunter presentation. © Shawn McMillen Photography. On the way to earning the grand championship, Colvin and Small Affair won the top tricolor in the Large Junior Hunter 16-17 division, sponsored by Chansonette Farm. The pair won two classes over fences, placed second in the handy, and also finished second under saddle. They were awarded the Chance Step Perpetual Trophy, donated by Brooke Carmichael McMurray-Fowler and Pam Carmichael Keenan. Parker’s Inclusive earned reserve honors in the division with Colvin in the irons for first and second place ribbons over fences and Emma Kurtz aboard for a fourth place finish under saddle. Colvin began riding Small Affair this winter and had consistent results with the gelding all season. The 12-year-old Selle Francais (by Elf d’Or) is owned by Lyn Pedersen and currently leased by Dr. Betsee Parker. The pair also completed the best Junior Hunter stake round with a high score of 90 to earn the Lyrik Challenge Trophy, donated by Ashley and Courtney Kennedy. Victoria Colvin and Small Affair. © Shawn McMillen Photography. 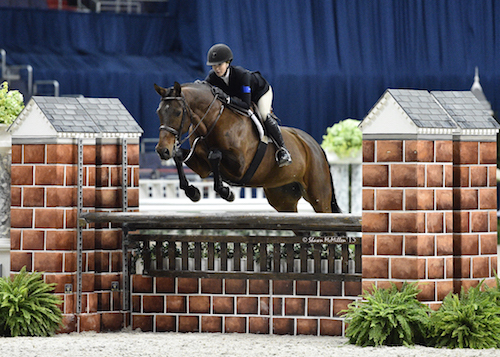 This is Colvin’s final year competing in the Junior Hunter divisions, and she has already moved up to show her talent in the international jumper classes with a win in Thursday’s $35,000 International Jumper Welcome Stake. She also finished second in Thursday night’s $20,000 Gambler’s Choice Costume Class, presented by the Winter Equestrian Festival. 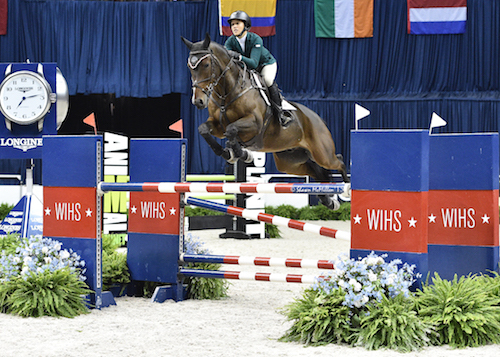 Along with a full schedule of hunters and jumpers, she has her sights set on winning this year’s WIHS Equitation Finals, presented by SAP, and took the first step towards making that dream come true with a fantastic round in the hunter phase on Friday. She took the early lead riding Dr. Betsee Parker’s Patrick to scores of 93 and 90 from the two judging panels for an overall high score of 91.50 in the first round of competition. Victoria Colvin and Patrick. © Shawn McMillen Photography. 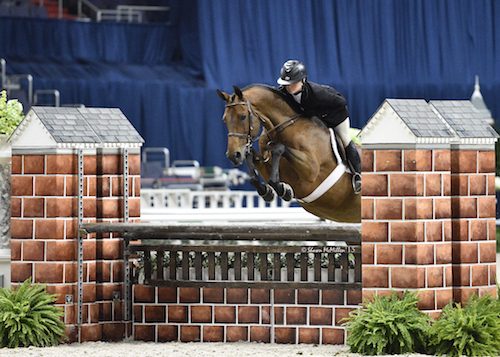 The WIHS Equitation Finals will continue on Saturday with all riders returning for the jumper phase. The hunter and jumper scores will then be averaged out to determine the top ten riders who will participate in the final work-off. The riders change horses by determination of a random draw by lot and then compete over the jumper course for final scores. After the hunter phase, Hunter Holloway sits in second place with a score of 89, Mckayla Langmeier scored an 88.25, Morgan Ward finished fourth with an 87.50, and Kelli Cruciotti stands fifth with a score of 86.875. Emma Kurtz and Kahlua. © Shawn McMillen Photography. Concluding the Junior Hunter divisions on Friday, the Small Junior Hunters 15 & Under, sponsored by Riverview Farm, awarded championship honors to Isabelle Aldridge’s Kahlua. Emma Kurtz rode the mare to two wins over fences and a fifth place finish under saddle. Laura Wasserman’s Fine Design jumped to second, third and fourth place ribbons and a sixth place finish under saddle to take reserve honors with Katherine Dash aboard. Hunter Siebel and Pure Abundance. © Shawn McMillen Photography. In the Large Junior Hunter 15 & Under division, sponsored by Entrust, Hunter Siebel jumped Mountain Home Stables’ Pure Abundance to championship honors with first, second and fourth place ribbons over fences. Leah Toscano led her own Estandar to the reserve championship, placing first and third over fences and third under saddle. Morgan Ward and Triton Z. © Shawn McMillen Photography. The Small Junior Hunter 16-17 division, sponsored by Sheila and Britton Sanderford, also presented championship honors on Friday. That division saw a win for Kaitlyn van Konynenburg’s Triton Z, ridden by Morgan Ward, with two wins over fences and a second place finish under saddle. Donald Stewart, Jr.’s Cold Case earned reserve honors with Ashton Alexander, earning first, third and fourth place ribbons over fences and a fifth place under saddle. The final award of the morning was the presentation of the Georgetown Trophy, which went to Vivian Yowan for her high score of 88 riding her own horse, Ransom. 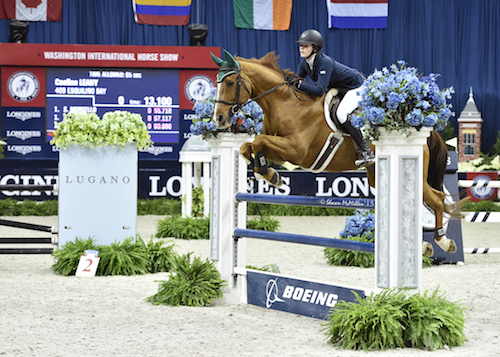 WIHS hosted the Junior/Amateur-Owner Jumpers in their first jump-off classes of the week on Friday afternoon with wins for Caelinn Leahy aboard Equilino Bay, and Lacey Gilbertson riding Easy Money. The $5,000 High Junior/Amateur-Owner Jumper time first jump-off class, sponsored by Staysail Farm, saw 21 starters and nine in the jump-off. Kelli Cruciotti was first to clear the short course in 32.23 seconds and eventually finished third aboard Serenity Equestrian Ventures’ Wallenberg. Lucy Deslauriers cleared the track next with a jump-off time of 32.63 seconds to place fourth riding Lisa Deslauriers’s Hamlet. Lacey Gilbertson followed with the winning time of 29.77 seconds riding Seabrook LLC’s Easy Money. Last to jump-off, Anna Dryden jumped into second place with her own Petrushka III in a time of 31.46 seconds. For the win, Gilbertson and Easy Money were presented the Cover Story Perpetual Trophy, donated by Rolling Acres Farm. Lacey Gilbertson and Easy Money. © Shawn McMillen Photography. The $2,500 Low Junior/Amateur-Owner Jumper time first jump-off was held earlier in the afternoon, sponsored by The Strauss Family, with 23 entries and 16 advancing to the jump-off. Seven entries also cleared the short course, with Caelinn Leahy clocking the fastest time of 29.72 seconds aboard Bellis Ltd.’s Esquilino Bay. The pair was awarded the Eleanor White O’Leary Memorial Perpetual Trophy, donated by Mr. and Mrs. Robert Ashton Hill and Miss Linden Joan Hill. Sima Morgello and Double S Farm LLC’s Zopala finished second with a time of 31.10 seconds. Sheer Levitin and her own Nabuco placed third in 31.76 seconds. Francesca Dildabanian and her own Catika van de Helle and Samantha Schaefer aboard her own Sugar Ray both tied for the fourth place prize with a time of 32.33 seconds. Caelinn Leahy and Esquilino Bay. © Shawn McMillen Photography. Competition continues on Saturday with the opening classes for the pony hunters followed by the $7,500 Senator’s Cup Low Junior/Amateur-Owner Jumper Classic, sponsored by The Strauss Family, and the $15,000 Ambassador’s Cup SJHOF High Junior/Amateur-Owner Jumper Classic, sponsored by Staysail Farm. The jumper phase for the WIHS Equitation Finals, presentation by SAP, will close out the afternoon session. The evening session begins at 7 p.m. with the WIHS Equitation Finals work-off with the top ten riders. 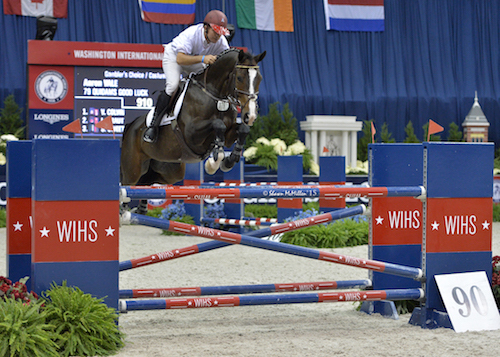 The $125,000 Longines FEI World Cup™ Jumping Washington, presented by Events DC, will conclude the night. The $20,000 International Jumper Gambler’s Choice Costume Class, sponsored by the Winter Equestrian Festival, was held on Thursday evening during the show’s always-popular Barn Night, presented by Dover Saddlery. WIHS apologizes for a miscalculation in scores and would like to congratulate Aaron Vale and Troy Glaus’s Quidams Good Luck on the win. Upon further review of their rounds, it was confirmed that Vale earned the victory with 1110 points. Laura Kraut (USA) finished second aboard Stars and Stripes’ Andretti S with a score of 1090. Shane Sweetnam and Spy Coast Farm LLC’s Chaqui Z placed third with a score of 1080. McLain Ward (USA) and Double H Farm’s HH Ashley were declared the fourth place finishers with a total of 1070 points. Charlie Jayne (USA) placed fifth with Alex Jayne and Maura Thatcher’s Bassandra with a score of 1050. 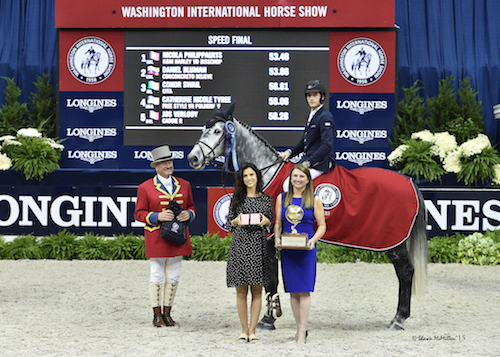 For the win, Vale earned the Crown Royal Trophy, donated by Crown Royal, as the winning rider, and Quidams Good Luck earned the Sue Ann Geisler Memorial Trophy, donated by the Washington International Horse Show, as the winning horse. For the costume competition, Vale was dressed as Quidams Good Luck’s owner, Troy Glaus, a former Major League Baseball player. Vale carried a baseball bat as he cantered into the ring and threw baseballs personally autographed by Glaus into the Barn Night crowd. Vale later explained that Glaus’s wife, Ann, is an amateur rider and originally imported the nine-year-old Hanoverian gelding (Quidam’s Rubin x Grannus) from England and rode him herself. She originally did eventing and trained with Buck Davidson, who Vale is good friends with. When Glaus decided to make the switch to show jumping, she began training with Vale since they live in the same town. 8. 11 Hunter Holloway VDL Bravo S 4.00 34.138 jump-off gray / 9y / G / Ephepe for Ever / Urbine S / KWPN / Hays Investment Corp.